He loved defending his country. Clay graduated from Centennial High School in Bakersfield in 2003. During his junior and senior years, Clay became involved with the Kern County Sheriff Explorer's Program, and had plans to enter Law Enforcement as a career. Clay's entire life plan, involved service to his country. Clay enlisted in the Army right out of High School and was inducted the following January 2004. Shortly after Clay enlisted, his 16-year-old fiancee Sara was killed in a car accident. That didn't stop him from delaying his training. He did his basic, then Cavalry Scout training at Ft. Knox, KY, and was based at Ft. Drum, NY, 10th Mountain Division. Clay had an abiding faith in The Lord, so he had no fear of dying. Clay was deployed in August of 2005 to Iraq. He was then based in Baghdad. On his 21st birthday, Clay was injured by a roadside bomb, then hospitalized. SPC Clay Patrick Farr earned his first Purple Heart Medal that day. SPC Farr was supposed to have been hospitalized for that injury, but he talked the doctor into releasing him so he could go back to his unit. Just one week later Clay was killed in action by a roadside bomb. He was awarded another Purple Heart, and the Bronze Star Medals. Army Spc. 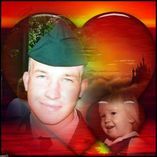 Clay P. Farr 21, Serving During Operation Iraqi Freedom assigned to the 1st Squadron, 71st Cavalry, 1st Brigade Combat Team, 10th Mountain Division, Fort Drum, N.Y.; was killed Feb. 26, 2006 when an improvised explosive device detonated near his Humvee during patrol operations in Baghdad. SPC Clay Patrick Farr US Army is interred at Arlington National Cemetery.